Fantasy baseball season is finally here, with the 2019 MLB season beginning on Wednesday with the MLB Japan Opening Series between the Athletics and Mariners. 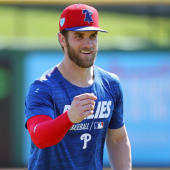 League-wide 2019 MLB Opening Day is on March 28 and everybody drafting between now and then will be looking to identify the 2019 Fantasy baseball busts, breakouts and sleepers who will define the season. Can Bryce Harper stay off the disabled list to live up to his new $330 million contract? Will Luis Severino fall back because of the shoulder inflammation that will keep him out until at least May? Those are the important questions that can be answered by a solid set of 2019 Fantasy baseball rankings, which is why you'll want to check out the MLB cheat sheets from the proven computer model at SportsLine before your drafts. Last year, their model warned that Orioles starting pitcher Dylan Bundy was being overvalued. Bundy was the No. 40 starting pitcher drafted on average in CBS Sports leagues, but finished at No. 68 thanks to a sky-high 5.45 ERA. The team at SportsLine was all over Bundy as one of its biggest Fantasy baseball busts from the start. Their model had him listed much lower than expert consensus Fantasy baseball rankings, and anyone who listened to their advice was well positioned for a league title. Their model is powered by the same people who powered projections for all three major Fantasy sites. And that same group is sharing its 2019 Fantasy Baseball rankings and cheat sheets over at SportsLine, helping you find Fantasy Baseball sleepers, breakouts and busts long before your competition. Their cheat sheets, available for leagues on many major sites, are updated multiple times every day. Any time an injury occurs or there's a change on a depth chart, the team at SportsLine updates its rankings. In fact, when it came to ranking players in Fantasy football, SportsLine's Projection Model beat human experts last season when there were big differences in ranking. And the model was the closest to the hole overall, meaning it best pinpointed where every player would finish each week. That could literally be the difference between winning your league or going home empty-handed. One of the potential 2019 Fantasy baseball busts the model is predicting: Astros shortstop Carlos Correa. Correa burst onto the scene in 2017, setting career-highs in home runs (24) and runs scored (82). He also racked up 133 hits and 84 RBIs that season, which resulted in an All-Star appearance for the shortstop. However, he failed to live up to the lofty expectations last year. In fact, Correa was limited to 110 games in 2018, which resulted in a pedestrian .239/.323/.405 line. Despite last year's struggles, the 24-year-old is being drafted in the fifth round in standard leagues this season. However, SportsLine's 2019 Fantasy baseball rankings say the 2017 All-Star won't return value at such a high pick. SportsLine's 2019 Fantasy baseball cheat sheets have Correa (fifth-round ADP) ranked lower than players like Jurickson Profar (seventh), Adalberto Mondesi (ninth) and even Jean Segura (ninth). Correa is one of this year's Fantasy baseball busts you'll want to completely avoid. Another player that SportsLine's Fantasy baseball rankings 2019 are fading: Yankees middle infielder Gleyber Torres. Torres had a strong rookie season with 24 home runs and an .820 OPS. However, the peripheral data suggests that his .271 batting average was a bit inflated considering a contact rate of just 70.9 percent and an xBA of .256. And because Torres only walked 42 times in 484 plate appearances during his rookie season, the concern is that if his batting drops off, his entire offensive profile will slack with it. Which is why the SportsLine Projection Model expects him to finish as the No. 12 second baseman in Fantasy baseball despite an ADP of 7. SportsLine is also predicting one of the consensus No. 1 players at his position to struggle mightily in 2019 and finish outside the top five. You'll want to avoid drafting him with an early pick, as that could be the difference in winning your league or going home with nothing. So which potential Fantasy Baseball busts should you avoid in your draft? Visit SportsLine now to get 2019 Fantasy Baseball rankings for every single position, all from the model that called Dylan Bundy's huge bust last season, and find out.